I’ve completely lost track of time since Tiny Human arrived — I’m not even sure what day of the week it is most of the time — so it’s no surprise that this crept up on me. 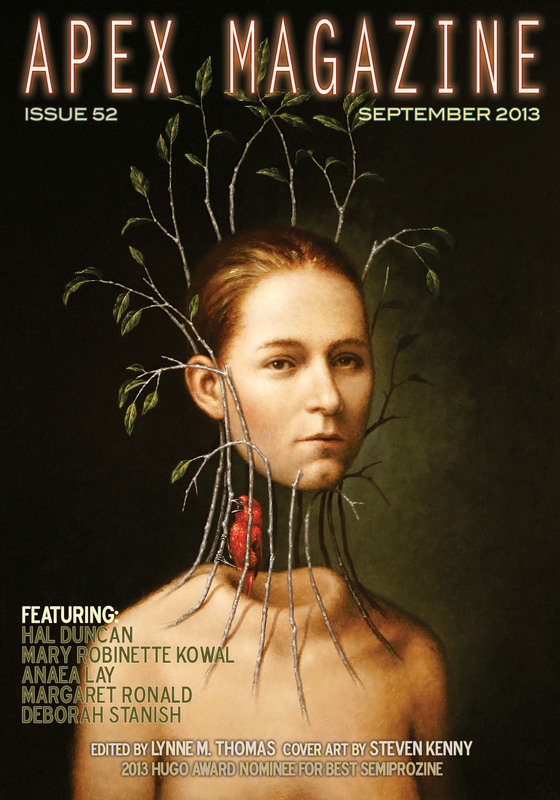 “Someone Like You” is now up at Apex Magazine, along with fiction from Anaea Lay, Mary Robinette Kowal, Hal Duncan, and Maurice Broaddus. This is a strange little story, and I’m not really sure where it came from. Originally it was a challenge I set myself — write something science-fictiony and keep it under 2000 words. Well, in revision the latter restriction got dumped, but it’s still one of the shortest pieces I’ve written. It’s also one of the few stories that I’m comfortable calling science fiction, rather than fantasy wearing deely-boppers and going “beep beep.” (Not that there’s anything wrong with that; I just wanted to try something that wasn’t masked fantasy.) Two elements came together in the story, and I’m still not sure whether I’ve handled them both well: the idea of using multiple worlds theory for practical computation and the appeal of a really, really dysfunctional relationship. The story’s available online, as an ePub via Apex’s site, and as a podcast read by Lynne M. Thomas. If you like it, consider subscribing to Apex — they have fantastic stuff on a regular basis.